Plymouth Argyle defender Gary Sawyer says he would like to see out his career at Home Park. The 30-year-old after five years away at Bristol Rovers and Leyton Orient. "I signed a year's contract, but the move down here was because I want to be down in this area," he told BBC Sport. "I love this club, always have done, and this is a club I would see myself staying with, so I would love for my career to finish where I started it." Sawyer, who grew up in Bideford, came up through Argyle's youth ranks, making his debut on the opening day of the 2006-07 season having spent the previous two years on loan at Exeter City. He went on to play 106 times for Plymouth before leaving for Bristol Rovers at the end of the 2009-10 season, and moved to Leyton Orient two years later. "I'd been looking to come back for a little bit," said Sawyer, who has many of his family and friends based in Devon. "I enjoyed London and Leyton Orient as a place, but it got to a stage when I just felt that this was where I wanted to move in my career and I wanted to come back to a club that I would consider home." 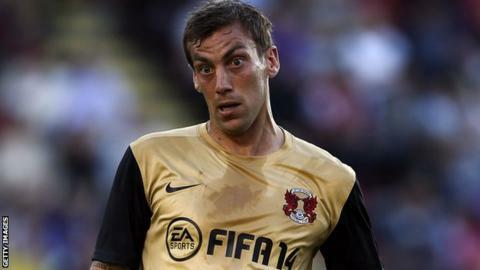 Sawyer was part of the Leyton Orient squad that reached the League One play-off final in 2014, which they lost to Rotherham on penalties. But he missed much of last season with injuries to his knee, calf and ankle as Orient were relegated after having four managers before Christmas, following Italian businessman Francesco Becchetti's takeover in the summer. "Last year was really frustrating with what was happening on and off the pitch at Orient, but it was even worse when you pick up injuries through the season. "It was a really frustrating year for me last year, one of the most testing I've had in my career," he said. "It was a fantastic thing for us to do with Leyton. To do it at Plymouth would be 10 times that for me because a lot of my family are Plymouth fans, a lot of my friends are Plymouth fans and this is where I started. To do it with a Plymouth shirt on would mean a lot for me. "I was lucky enough to play here when we were in the Championship and we used to fill the stadium every week and we did well at that level. "There's no reason why we can't go back to that sort of level."